The Abuja Division of the Federal High Court, on Wednesday, adjourned further hearing on the examination malpractice charge the Nigerian Police Force, NPF, levelled against Senator Ademola Adeleke, till June 10. 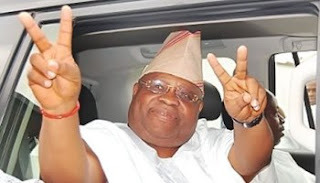 Police had in a seven-count charge it entered before the court, alleged that Adeleke who was the candidate of the Peoples Democratic Party, PDP, in the last Governorship election in Osun State, fraudulently registered and sat for the June/July 2017 Senior School Certificate Examination that held in February 2017. He was charged alongside his brother, Sikiru Adeleke, the Principal of Ojo-Aro Community Grammar School, Ojo-Aro Osun State, Alhaji Aregbesola Mufutau, the School Registrar, Gbadamosi Thomas Ojo, and a teacher in the school, Dare Samuel Olutope. In the amended charge marked FHC/ABJ/CR/156/2018, and dated December 15, 2018, Police, maintained that the Defendants, committed examination malpractices by fraudulently, through impersonation, registering Adeleke and his brother, Sikiru, as students of Ojo-Aro Community Grammar School in Osun State, for the National Examination Council, NECO, June/July 2017 Senior School Certificate Examination. The prosecution has so far produced four witnesses to testify in the matter. At the resumed trial on Wednesday, NECO Supervisor, Mr. Odesola Emmanuel, who appeared as the third prosecution witness, PW-3, told the court that out of 58 candidates that sat for the 2017 exam, he did not see the two Adeleke brothers (Ademola and Sikiru). The witness, who told the court that he supervised candidates that sat for Economics exam, added that though Ademola’s name appeared in the NECO Register as No 057, he was not sighted in the examination hall.